After a little hiatus, our weekly Frugal Fashionista is back. As I dressed this morning for my weekend conference (yes, if you saw me today, you know this is a real time post), I realized that this is a prime example of dressing comfortably, dressing classy and dressing 100% Frugal Fashionista style for close to $5. I was feeling pressure that I needed to give you some amazing outfits after my little break, but an epiphany hit that this is what it’s all about. This is how I dress day in and day out, and I’ll just start showing them to you with out any pressure. So look for more Frugal Fashionista posts with my every day dollar outfits. I know that in the past I have mentioned to stay away from patterns at thrift stores, but that’s only if you are nervous about picking out second hand stores clothes where the pattern could potentially date you back to the 80’s look. Some of you might not know it unless we told you, so if you’re ever unsure, avoid them. I love patterns, but if I am going to wear them, I always pair them with a solid. This cotton skirt is a bit “busy,” and is definitely not a trendy designer look, but the skirt was $1 at a yard sale and is more comfortable than any shorts or jeans I own. That was my primary reason for wearing it. Sometimes we think that it takes work to dress up, yet I put this outfit together in minutes. Like I said, my number one priority was literally comfort, nothing more, but it just so happened that it ended up working. 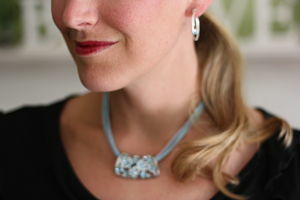 By adding a pair of $0.50 silver earrings (that have a small blue crystal in the hoop), along with a $1 yard sale blue necklace it took the outfit up just a notch on the dressy side. (Pictured at the top) I found this great, blue glass bracelet at Myrtle Beach for $1.99. This is what happens nearly every single “photo shoot.” My son loves the “sports” mode where four pictures are shot in a second. He shot off about 30 pictures before I could finally stop them. Many of them show me about to strangle his cute neck. Can you tell what I am saying? I like the black shirt A LOT and the jewelry is such a nice touch with this comfy but classy-looking outfit. These are my favorite of your posts!!! That is really cute! Surprisingly enough I think I like the skirt paired with the lighter shirt better…. (gasp!) Is that your new rug you are standing on in front of the fireplace? Such a cute outfit!! I love it!! As a plus-size, I find skirts a lot more comfortable than pants — less binding, cooler. And more flattering to my apple shape. That said, I mostly wear SHORTS for doing housework, washing the dog, helping with house repair projects, and gardening. They might not be flattering, but they’re more modest for grubby work. You look wonderful! I hit the mother lode yesterday at a local thrift store. All red line items were 50 cents. I bought a long black cotton blend tank dress, which is a little too long but I can cut & hem with the best of them. 3 pairs of capris, two tank tops and two long sleeve thin shirts with bling on them ( new with tags). I bought my youngest son a pair of Nike shoes with absolutely no wear on them. My youngest daughter ( the dog food cake baker) will be wearing Gap shorts and capris this summer. All bought yesterday. All for 6.00. Thanks to you, I will never pay retail for clothing again! I love your frugal fashionista posts – keep them coming all summer long! Yes, keep the frugal fashionista posts coming! Hmmm, may have to rethink the skirt vs shorts/capris for the summer. You look smashing as usual…inspiration to all of us! I LOVE cotton skirts in the summer! I have several stretch cotton ones I actually wore while pregnant and post partum, but am still wearing (stretch, right?) because they are so comfy! I pulled weeds in a t-shirt dress this morning … in front of my house on the busy street. 🙂 I am taking a break from buying any clothing right now, though, except for the kids if it’s something they really need. I have plenty and think maybe if I clean out the closet and pare down to only my favorites, my life will be simpler, my closet roomier and maybe by then the budget will have more stretch, too! Thanks so much for sharing your finds – you bless me (and others, too)! I LOVE these posts! I have been so inspired by you to shop at thrift stores that I don’t even go to the mall/Wal-Mart/Target anymore for clothes. My wardrobe now consists of high end labels (Ann Taylor, Banana Republic, Loft, Gap) all for less than $5 apiece! Thanks a million and keep it coming! Love the outfits! Love this post! So happy to see a Frugal Fashionista post…love these! Great outfit and accessories. Great again! These are my favorite posts too. I am another thrift store convert. The quality of the clothes in my closet continue to improve, while the price tags go down. Keep the Frugal Fashionista posts coming! 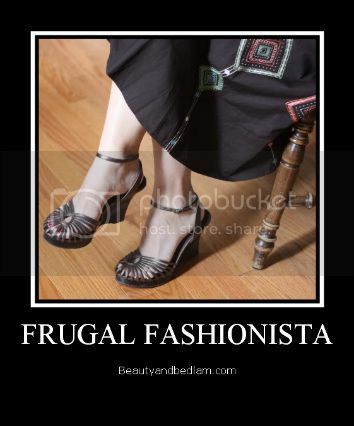 Love, love, love the frugal fashionita posts….they are my favorites of all your stuff! Thanks for sharing all the tips. Your jewelry is super cute….love the earrings and necklace. Hi Jen, thank you for leaving a comment on my blog. I’ve been reading your blog for months; I don’t know how I found it. I might have left a comment once. Anyways, love your posting “the art of negotiation.” I can’t believe your fabulous outfit is only $5.